Al-Qaeda in the Islamic Maghreb (Arabic: تنظيم القاعدة في بلاد المغرب الإسلامي‎, translit. 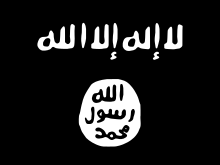 Tanẓīm al-Qā'idah fī Bilād al-Maghrib al-Islāmī), or AQIM, is an Islamist militant organization (of al-Qaeda) which aims to overthrow the Algerian government and institute an Islamic state. To that end, it is currently engaged in an anti-government campaign. The group's official name is Organization of al-Qa'ida in the Land of the Islamic Maghreb (Qaedat al-Jihad fi Bilad al-Maghrib al-Islami), often shortened to Al-Qaeda in the Islamic Maghreb (AQIM, from French al-Qaïda au Maghreb islamique, AQMI). Prior to January 2007 it was known as the Salafist Group for Preaching and Combat (Arabic: الجماعة السلفية للدعوة والقتال‎ al-Jamā'ah as-Salafiyyah lid-Da'wah wal-Qiṭāl) and the French acronym GSPC (Groupe Salafiste pour la Prédication et le Combat). 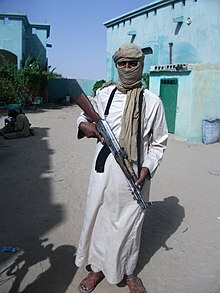 The United States National Counterterrorism Center stated that AQIM had a reputation for holding cultural and racial insensitivities towards Sub-Saharan Africans. The NCTC maintained that some recruits "claimed that AQIM was clearly racist against some black members from West Africa because they were only sent against lower-level targets." The bulletin goes on to say that former AQIM commander Mokhtar Belmokhtar in August 2009 stated "he wanted to attract black African recruits because they would agree more readily than Arabs to becoming suicide bombers and because poor economic and social conditions made them ripe for recruitment." 20 January 2019: AQIM claims the attack on 10 UN Mali peacekeepers due to Chad's restoration of relations with Israel. ^ a b "Al-Qaeda in the Islamic Maghreb (AQIM)". Council on Foreign Relations. 27 March 2015. Retrieved 2 July 2015. ^ "Tunisian al Qaeda wing claims IED ambush - FDD's Long War Journal". www.longwarjournal.org. 14 December 2017. ^ "Al-Qaedaâ€™s Resurrection". Council on Foreign Relations. ^ Lauren Ploch Blanchard. "Nigeria's Boko Haram: Frequently Asked Questions" (PDF). fas.org. ^ "Orphans of the Sahara, part three, from minute 38:29". Al Jazeera. 23 January 2014. ^ "Orphans of the Sahara, part two, from minute 28.30". Al Jazeera. 16 January 2014 [interview dates from Spring 2013]. ^ "UPDATE: 1 year on, new video of kidnapped Swiss missionary in Mali". 11 January 2017. Retrieved 2 February 2017. ^ "Al Qaeda group claims kidnapping of Australians in Burkina Faso". 6 February 2016. Retrieved 2 February 2017. ^ Editorial, Reuters. "Mali car bomb attack kills four civilians, wounds four French soldiers". U.S. Retrieved 1 July 2018. ^ News, VOA. "Al-Qaida Affiliate Claims Responsibility for Mali Attack". VOA. Retrieved 2 July 2018. ^ Weiss, Caleb (9 July 2018). "Al Qaeda wing ambushes police officers in northern Tunisia". Long War Journal. Boeke, Sergei (2016). "Al Qaeda in the Islamic Maghreb: Terrorism, Insurgency or Organized Crime?". Small Wars and Insurgencies. 27 (5): 914–936. doi:10.1080/09592318.2016.1208280. Lecocq, Baz; Schrijver, Paul (2007). "The War on Terror in a Haze of Dust: Potholes and Pitfalls on the Saharan Front". Journal of Contemporary African Studies. 25 (1): 141–166. CiteSeerX 10.1.1.510.2775. doi:10.1080/02589000601157147.